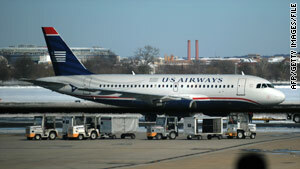 US Airways is the latest airline to request an exemption to a new tarmac delay rule. (CNN) -- US Airways has joined a handful of other carriers in filing for an exemption from the tarmac delay rule going into effect next month. The airline has asked the Department of Transportation for a waiver to the rule for its hub in Philadelphia, Pennsylvania. The rule, set to go into effect April 29, could fine the airlines $27,500 per passenger on domestic flights that sit on the tarmac for more than three hours with passengers on board. US Airways joins Delta, American and Continental in supporting a request by JetBlue for a waiver at New York's John F. Kennedy International Airport, which Continental expanded to include the New York area's other major airports -- Newark Liberty International and LaGuardia. A construction project that has shut down one of JFK's runways prompted the initial requests. US Airways wants an exemption in Philadelphia "because it shares the same airspace, is part of the same air traffic control center (New York Center), and has the same congestion challenges as JFK, LaGuardia and Newark," according to a document filed with the Department of Transportation. The airline also states the proximity of the four airports -- less than 100 miles apart by air -- creates "the most complex airspace configuration in the world" in one of the smallest airspace regions in the country. The DOT has not made any decisions about the exemption requests. "Carriers have it within their power to schedule their flights more realistically, to have spare aircraft and crews available to avoid cancellations," said DOT spokesman Bill Mosley in a statement. Earlier this month Continental Airlines CEO Jeff Smisek said Continental would cancel flights to avoid the stiff penalties, according to a webcast from an investor conference. Passenger rights advocate Kate Hanni, founder of the airline consumer group FlyersRights.org, is strongly opposed to any exemptions to the rule. "The fact that the airlines are already working actively to find loopholes and excuses to avoid compliance with new consumer protections before the regulations even go into effect demonstrates their continued hostility to consumers and new laws and policies designed to protect them," Hanni said in a statement following JFK exemption requests.